Tentsile, a UK-based brand which recently established its first U.S. outfitter location in Bend, and which is known for its innovative and portable tree tents, has announced the launch of five new products for Spring/Summer 2018. Tentsile Tree Tents were conceived as tree houses that can set up anywhere — from camping to festivals and backyard adventures. A cross between a hammock and a tent, their suspended sleepers consist of a flat and firm surface that attaches to three trees. Its bug-netting roof allows for stargazing, and insect-free sleeping, while an additional rain fly adds protection and privacy. Tentsile’s newest offerings include four new tents designed for a variety of tree top adventures. Built to house up to four occupants, the new tents feature a variety of entrance options and internal configurations built with generous platform berths and storage space. The interiors are completely insect and rain-proof with its “no-see-um” mesh, yet the entire tent can be easily covered by a clip-on rainfly. The T-Mini Kidz is specially designed for kids and families looking for an entry level product. Tentsile’s Safari models are constructed from high-quality UV-resistant fabrics and secured by heavy-duty ratchets and seat belt grade webbing. These tents can be left in place for months and are designed to weather the elements with the highest quality, toughest and most UV resistant materials available. The Safari Stingray is the biggest, most robust model. Built to easily fit three people with a spacious, triple hammock interior that keeps campers separated and comfortable, and a rip-resistant durable micro-mesh that shields you from insects. The tent is accessed via a floor hatch in the center and a large front door. With straps holding the Stingray aloft, Tentsile says it can be suspended between just about anything… including trees, trucks, and boulders. It also has a removable rain fly for maximizing views and superior protection. The Safari Connect is designed for two people with an adjustable double hammock bed with two large pockets on each side, full no-see-um mesh top with four fold-away doors and a removable rain fly for unbeatable views. The rain fly can be pegged out towards the ground, creating a large covered porch area. The Stealth Tree Tent is a three-person, modular tent with a fully removable insect mesh and rain cover. This model utilizes a ‘TriPad’ pole socket to create three separate entrances, one on each side of the tent. Each occupant has their own generous hammock berth, storage space in the central tower shelf and the ability to modify their own interior ventilation. The three adjustable hammocks can be separated or combined using the adjustable under floor strap system. The interior is completely insect proof, rain proof and UV resistant, made from no-see-um mesh and easily covered by a clip-on rainfly. The entire roof can be fully removed for unobstructed views of the trees overhead. 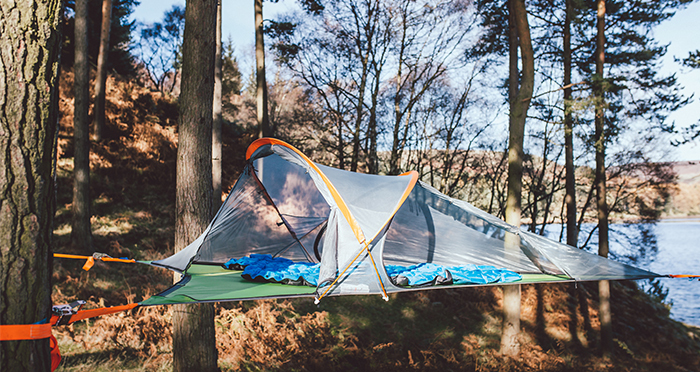 This single-person model is the lightest tree tent, geared toward hikers and backpackers looking for a unique and comfortable above-ground sleeping experience. The UNA features a tensioned hammock bed with large internal pockets on each side, a full no-see-um mesh top with a fold-away door and a removable rain fly. The rain fly can be pegged out towards the ground, creating a covered area for gear storage and additional ventilation.